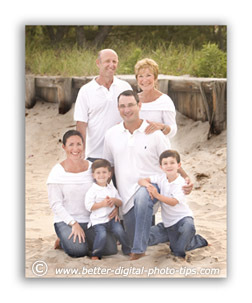 Here are family portrait tips to use for families and small groups that will help your portraits stand out. You can take beautiful and creative family portraits with just a little planning. Rather than just plop down your subject on the couch and take a quick snapshot, think it out just a bit ahead of time. One of the biggest mistakes you can make in portrait photography is not having at least somewhat of a game plan before you start posing. What kind of feeling do you want your photograph to convey? Will it have a fun and relaxed mood? Will it be serious and posed? Perhaps you want a formal family portrait. If you've ever viewed a family portrait and heard yourself saying, "Wow, that's a really nice portrait," then it may be that style of photograph you wish to create. 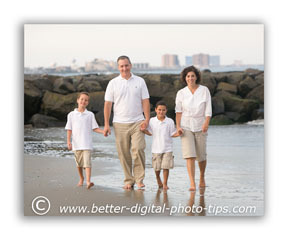 In this beach portrait above, we captured a family enjoying a walk along the beach. Although we planned the photo and had the subjects make several trips along this strip of sand, it does not appear to be a posed image. What I mean by that is to look for ways to use existing things in the environment to frame in your subject when possible. When you're outdoors that could be a couple of trees to the left and right of your subject. I used the wooden support posts as a partial framing device in this portrait of this couple during a family shoot in a local park. It had started to rain a little during our photography session, so we ducked under the roof of the pavilion. I stood out in the rain while my subjects stood under cover of the roof of the pavilion. I had to be careful to position myself so that the tree behind this couple did not appear to grow out of either of their heads. Whenever I do beach photography, I have to plan around the direction of the wind and direction and intensity of the sunlight. If the sky is very clear and it's still before sunset, the sun can be too harsh for me to shoot with the water behind my subjects. On the East coast of our country, the sun sets over the land. I have to look for good backgrounds where the lighting on my subject is good as well. In this family portrait, I found this storm wall with vegetation that provided a nice background for this family portrait. Ideally, I would have like to get more of a diagonal line (not so horizontal) with the sea wall behind them. 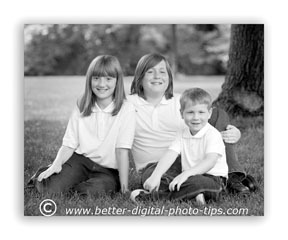 Another family portrait tip is to consider making black and white photos. Black and white photography can have many effects on the emotional response we get when viewing it. Black and white creates a historical feel to portraits. With digital photography, it's easy to take color portraits and edit them into black and white portraits afterward. Just remember that patterns, textures and shapes of clothing and background can add business in a portrait. Those elements become even more prominent when the image is black and white and color has been eliminated. If you are interested in black and white family portraits, here are the Top 5 reasons to use black and white photography. 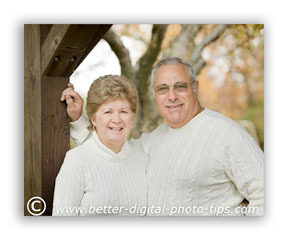 If you have an interest in more creative family portraits, you will enjoy reading this article on Family Portrait Ideas. 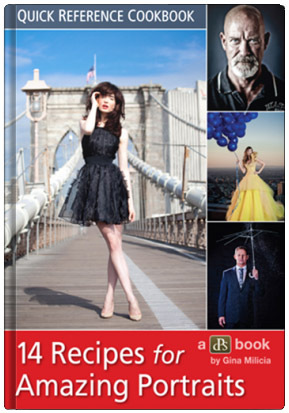 There is an opportunity for you to share your creative photography thoughts and your portraits with other readers. As always, make sure you have fun as you discover tips on taking digital photography.